The Harry Potter book series made magic wands the must-have addition for any aspiring wizard. But what exactly are they? Do they work? And if so, how? In J.K. Rowling’s world, wands are mystical tools made from a wide variety of wood. At the core is a magical talisman from some mythical creature such as a phoenix feather, dragon heartstring, or unicorn hair. And as Hermione tells Harry, you do not choose the wand – the wand chooses you. Rowling’s sticks contain supernatural powers that assist the youngsters in casting various spells, and seem inspired by a few elements from European folklore and a good deal of literary license! Traditionally, the wand was associated with wizard’s staff and the monarch’s scepter, and may have first originated as a phallic symbol. It has also been suggested it derived from the shaman’s drumming sticks, which were widely used as pointers in magical ceremonies. The first literary reference appeared in Homer, when Circe used a wand to turn Odysseus’ men into wild pigs. But how do the facts differ from the fiction? * Wands are usually made from wood, but they can also be made of stone or metal depending on the type of spell required. For example, copper wands are used in healing. * These rods are tools used to focus the power of the wizard but they do not work magic by themselves. They guide and direct human energy to the proper, desired place. * Wands are associated with the element of air (and sometimes fire). * Spirals are sometimes incorporated into their design to represent the beginning and end of everything. They also create a vortex that harnesses energy. * Each wand is unique. They are quasi-sentient – inanimate objects with animate characteristics. * They can be used for protection, empowerment, healing, and love spells. 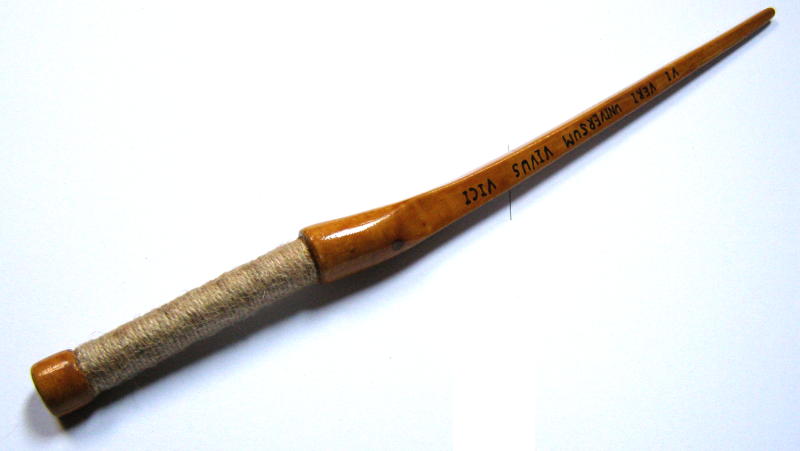 * Beginners should use flexible wands made from ash or willow. Experts may graduate to hard woods like ebony and oak. * Wands need to be cleansed on a regular basis to keep their energy strong and pure. * They can be recharged in sunlight or full moonlight. * Power builds up in the handle and is released through the tip. * Whatever you send out to others comes back three times stronger – therefore a magician should always send out blessings instead of curses! But do they actually work? You tell me . . .
“Wand” – Wikipedia. Accessed 4/2/2015.